Hudson's First Citizen . . . If COLUMBIA COUNTY and the City of Hudson should designate its first citizen, the honor would be to Jan Franz Van Hoesen, a native of Holland who on June 15, 1662, purchased a tract of land from the Mohicans, the Indian tribe who had entertained Henry Hudson so hospitably at a point near Stuyvesant a half century before. This tract included the ground which the City of Hudson is built and a portion of Greenport. It extended along the river from Stockport Creek on the North, to the mouth to Kishna Kill on the South, which empties into South Bay near Mount Merino, and on the East to Claverack Creek. It is probable that Van Hoesen, who is said to have fled the Netherlands so he would not have to renounce his Protestant religion, thought only of the agricultural possibilities of the land along the flowing river. During all the years of his occupancy, he probably never imagined that a future city would rise from the hill where his fertile bouwerie was first established. This vast acreage became the focal point of an early litigation, for no sooner had Van Hoesen received his grant, than Governor Dongan gave a patent covering the same land to Killian Van Rensselaer, grandson of the first patron at Fort Orange, now the City of Albany. VAN HOESEN, also known as “Jan The Red Head,” is said to have had a fiery temper and he carried out a bitter and expensive litigation against the powerful and wealthy Van Rensselaers.’ Jan finally established title to his property and the Van Rensselaers were compelled to confine their operations east of the Claverack Creek. The old patentee died about the year 1703 and among his children he left were Jurrien, Jacob Jans, Johannes and Catherine. The lands were divided among his survivors and it was the division line which gives Hudson’s Partition St. it’s name One of the paths leading inland from the river to the interior farms was called the “Waggon Way,” which eventually became Columbia Turnpike, the present Route 66 leading to Gent and Chatham. 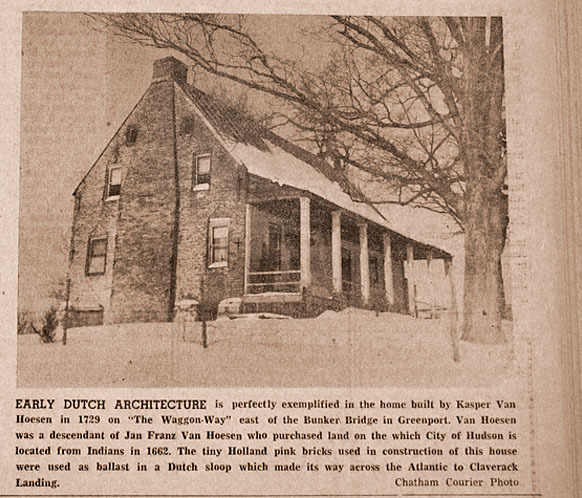 It is on the old “Waggon Way” that Deacon Kaspar Van Hoesen, one of the original signers of the Claverack Dutch Reformed Church charter, built a handsome brick house that still stands today just east of the old Bunker Bridge in Claverack township. Kaspar, a descendant of the original patentee Jan Franz Van Hoesen, was so proud of this edifice that he had the inscription “K.V.H., 1729” placed on the north wall. The home was subsequently occupied by the Ludlow and Benton families and today is the residence of Mrs. Minnie McKittrick, an alert little lady of 82 years, who has resided in the handsome old home since 1923. Her late husband, William McKittrick, who died in 1924, was a dairy farmer and a well known Columbia County poultry fancier. Mrs. McKittrick recalls many stories told about her homestead. The tiny pink bricks in the masonry, about half the size of present day bricks, were made in Holland, she was told, and were used as ballast in a sailing sloop which made it’s way to Nieuw Amsterdam and eventually upriver to Claverack Landing. In the cellar is a huge Dutch fireplace, the original iron work is still secured in the walls and throughout the entire structure from a huge attic to the cavernous cellar are exposed oaken beams. The kitchen and living room were divided by Mr. McKittrick many years ago, but peeping out from either side of a partitioned fireplace are the handsome outlines of a delicately moulded Adams period mantle. Wooden pegs instead of nails are found throughout the house and hand-turned screws are discovered frequently in the woodwork. A few years ago, the New York State Education Department made a careful study of the 231-year old home and advised Mrs. McKittrick the 13-step stairs leading to a second floor were extremely unusual in their architectural beauty and simplicity. The first nine steps from a central hallway go up to a platform and then turn right angles where four more steps continue the stairway to the upper hall. Floorboards many almost two feet wide, are common. Old brass locks and latches and huge keys which originally bolted the doors against marauding Indians are still intact. Several years ago, while exploring the cellar with her brother, Mrs. McKittrick discovered what she believed was a “secret passageway” leading from the interior of the house to the outdoors. Whether this would afford easy entrance to the home in the event of an Indian raid could probably only be determined by architectectural experts. During Mrs. McKittrick’s lifetime the old home has been known as “The Colonial Farm” and it’s 100 acres along Claverack Creek are still tilled by neighboring farmers. It was not too many years ago, the old lady recalls, that great hickory woods abounded in the vicinity and her husband cut hickory posts which he piled near the roadside for sale to passersby. Of particular interest to those who inspect the house, is a white plaster coating that has been placed over the front of the building. This is rapidly breaking off and underneath can be seen the pink Holland brick, it’s mortar of two centuries ago, still firm and intact. The long, angular sloping roof is typical of the early Dutch architecture and only a few years ago, Mrs. McKittrick restored the supporting posts which were beginning to sag with the passing of time. Several of the windows on the first floor have been replaced with modern glass, but four windows on the second floor still have intact, the original hand blown glass which has an almost blue tint in the sunlight. Mrs. McKittrick admits she has had many offers to buy the handsome old structure but she has turned them down. “I’ll stay here as long as I can,” she says wistfully, “this old house is just too fine to leave.” When the house is sold, it can be fervently hoped that it will be restored to the grandeur of the days when Deacon Kaspar Van Hoesen watched the first pink bricks go into place almost two centuries and a half ago. Reproduced here with permission of Chatham Courier Newspaper Inc.